The new sulfur, carbon dioxide limits ewill demand precise understanding by ship owners and operators. As of January 1, 2020 the IMO will require a reduction in the sulfur content of fuel oil of all ships to a global sulfur limit of 0.50 percent m/m (mass/mass), from the current global level of 3.5 percent m/m. While this new limit will not change the lower limits in SOx Emission Control Areas (ECAs), it will cause a significant change in the demands for certain bunker fuels. 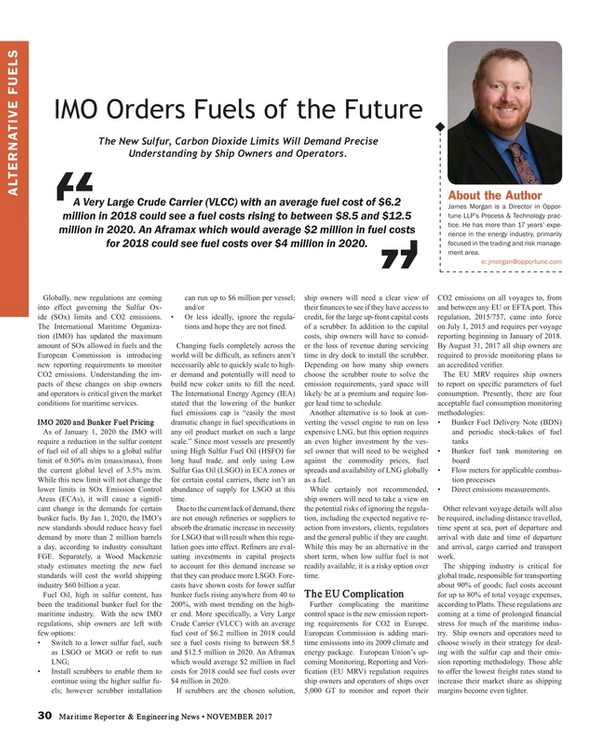 By Jan 1, 2020, the IMO’s new standards should reduce heavy fuel demand by more than 2 million barrels a day, according to industry consultant FGE. Separately, a Wood Mackenzie study estimates meeting the new fuel standards will cost the world shipping industry $60 billion a year. Changing fuels completely across the world will be difficult, as refiners aren’t necessarily able to quickly scale to higher demand and potentially will need to build new coker units to fill the need. The International Energy Agency (IEA) stated that the lowering of the bunker fuel emissions cap is “easily the most dramatic change in fuel specifications in any oil product market on such a large scale.” Since most vessels are presently using High Sulfur Fuel Oil (HSFO) for long haul trade, and only using Low Sulfur Gas Oil (LSGO) in ECA zones or for certain costal carriers, there isn’t an abundance of supply for LSGO at this time. Further complicating the maritime control space is the new emission reporting requirements for CO2 in Europe. European Commission is adding maritime emissions into its 2009 climate and energy package. European Union’s upcoming Monitoring, Reporting and Verification (EU MRV) regulation requires ship owners and operators of ships over 5,000 GT to monitor and report their CO2 emissions on all voyages to, from and between any EU or EFTA port. This regulation, 2015/757, came into force on July 1, 2015 and requires per voyage reporting beginning in January of 2018. By August 31, 2017 all ship owners are required to provide monitoring plans to an accredited verifier. James Morgan is a Director in Opportune LLP’s Process & Technology practice. He has more than 17 years’ experience in the energy industry, primarily focused in the trading and risk management area.